I’ve ingested so many All-In-One-Day books and movies and episodes of TV before, and yet I never seem to tire of them. In fact, it’s one of my favorite tropes. However, what happens if that magical one day… doesn’t stick? What if the haze of bliss erupts in an instant to show that you’re not changed, you’re not brand new? You’re still enveloped in all of the things that you don’t like about yourself times about seventy kabillion, and now you’re even more aware of it than you were before. This is Just One Day. This is what Allyson Healey has to face once she awakens alone in Paris after a day unlike any other. After an experience like that, where does she go, not only immediately, but existentially too? How will Allyson find herself again when she wanted to lose herself in the first place? More importantly, how can I find out what happens in Just One Year before next fall? Just One Day raises so many questions. I’ve been trying to figure out the best way to say this, so here goes: Allyson makes a ton of decisions that make me crazy and with which I do not agree. However, she is also compelling as hell. These two aspects don’t always mesh, at least in my mind, but in this case, they do in the easiest way. There were times when I may have wanted to grab Allyson by the shoulders and bodily shake her (I know it’s a romantic notion, but DO NOT wander off with a complete stranger to a whole ‘nother country!! ), but I also desperately wanted to travel along on her journey. Plus, it’s so easy to slog through the tough parts with Gayle Forman behind the wheel. She writes these densely provocative and beautiful passages that pull you in, yet they are entirely readable and accessible. She makes you feel smarter while she’s also teaching you something new. It’s brilliant. More than anything, I can’t stop thinking about how the story goes past the one perfect day into the starkness of reality. Everything doesn’t become hunky-dory once you step outside the box, and Allyson finds this out in a pretty harsh way. This is about walking that razor thin line between the straight-laced, non-wave-making Allyson with the throw-a-book-at-a-jackhole-and-run-for-your-life Lulu. When she falls too much into one “character” or the other, she falls and she falls hard. It’s only when she finds her balance that she becomes even more compelling. While I blew through this book in a matter of days and absolutely enjoyed it, I know I will love it even more once its companion comes along. Just One Day deftly weaves us through Allyson’s side of things, but it raises so many unbelievably I-need-to-know-right-this-very-instant questions, the most burning of which is Dude, Where’s my Dutchman? Like, honestly. What? Where? How? AND WHY? Willem, I have questions. You have answers. Let’s discuss. 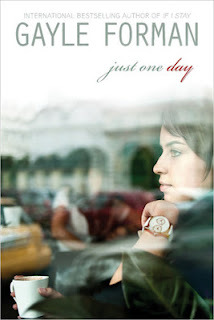 Needless to say, Just One Day is one you need to read, especially for all Gayle Forman fans. I haven’t craved macarons this much since Anna and the French Kiss. I’ll be rereading this plenty of times between now and Just One Year. Absolutely LOVED this book. I cannot wait for Just One Year.